Last week we told you about a sale that dropped the 33-foot version of our favorite wireless camera accessory to just $29.99, and hundreds of our readers jumped on the deal. This week, the more compact model is on sale for the same low price. 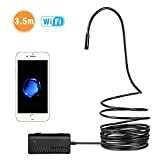 The 11.5-foot Depstech WiFi Borescope Inspection Camera retails for $36, but you’ll only pay $29.99 if you use the coupon code XHUQOC66 at checkout. This awesome accessory lets your iPhone or Android phone see where no other phone can, and it’s a killer value at this price.